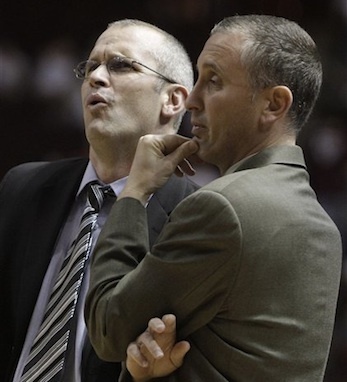 Dan and Bobby Hurley were destined to dribble down the basketball coaching court. After all, the brothers are the sons of Irish-American basketball coach and Basketball Hall of Famer, Bob Hurley. As of April 2010, Dan Hurley is the head coach of the NCAA Division I basketball team at Wagner College in Staten Island, New York. Bobby Hurley is the assistant coach of the team. Both Dan and Bobby grew up playing basketball at St. Anthony High School in Jersey City, NJ, where their father, Bob Hurley, has been the longtime coach. Dan went on to play basketball for Seton Hall, where he scored 1,070 career points. He graduated and began his coaching career in 1996. While serving as head coach from 2001 to 2010, Dan built St. Benedict’s Preparatory School team into one of the top high school basketball teams in the country. From 1989 to 1993, Bobby Hurley was an all-star point guard on Duke’s basketball team. While at Duke,Bobby achieved 1,076 assists, making him the NCAA all-time assist leader and Duke’s single-game assist leader with 16. In the 1993 NBA draft, Bobby was chosen to play for the Sacramento Kings, for which he played until 1998. The Hurley brothers have improved the Wagner Seahawks team significantly. Dan Hurley is proving to be a top head coach in his first year: the Seahawks plus-eight win improvement is the highest among 54 first-year Division I head coaches.